For the sugar instead of Agave..is it 10tbls as well? That seems really sweet. Yes, if you prefer less use less. This was delicious! I used pecans, because I couldn't find hazelnuts, and used 4 eggs instead of 3 eggs + 2 whites (I'm lazy and didn't want to waste the yolks). So fast and easy. Would Almond flour work in place of the all-purpose flour? Yes it is! I'm sure it would work with skim milk. 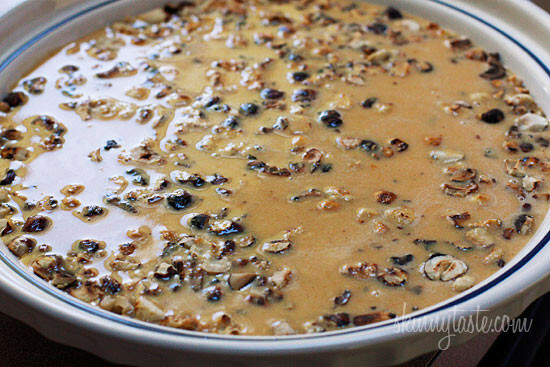 I am curious to know if it would work well with skim milk? Also, is that a Longaberger pie plate? I LOVE mine!!! This looks awesome, I wish I'd seen it earlier today, as I was in charge of pumpkin pie. 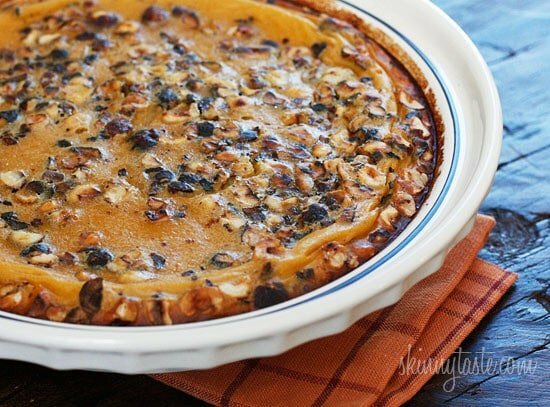 I still would have made my traditional pumpkin pie (using butternut squash instead of pumpkin) because my family insists on it, but I definitely would have made this for my smaller pie instead of the Weight Watchers pie I made. I love the idea of halving this and making it in ramekins. I'm so going to do it!! 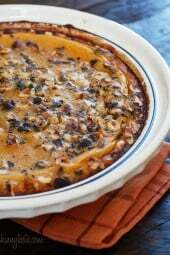 And I will still use butternut squash – the texture is very, very smooth. Try it out! Great, glad you enjoyed it!! I made this the other day. Yum- it's a keeper! Can't wait to share it with some friends soon. It uses such a small amount of flour, I think gluten free flour would work. Gina I would like to make this but my mom doesn't eat wheat, do you think that I could make it with spelt flour? I think any milk would be fine, I'm not sure how much stevia I would use, I personally don't care for it. 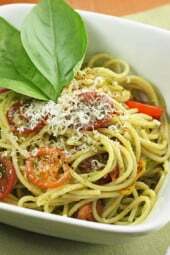 Gina, I love this recipe idea! I may try it out on my family for Thanksgiving. I'm allerguc to sugar, and I like to use stevia as a sweetener (I find that the liquid kind dissolves best). Any idea how much liquid stevia I'd need to use instead of the agave? Also, since I'm allergic to dairy, I'm thinking of subbing coconut milk or maybe hazelnut milk (if I could find one without sugar) for the milk. I think the coconut might work well to replace some of the bulk of the agave. I cannot wait to try this, it looks uhhhhhmazing!! Do you think you could use a disposable pie tin, or would it have to be ceramic to bake right? Made this tonight and used gluten-free all purpose flour and almond milk and it turned out great! The only problem is that there was no way to eat just one slice!! No, the points remain the same with sugar or agave. You could even use honey, or maple, whatever you prefer in a sweetener. Does using sugar instead of agave change the points? This looks absolutely heavenly! My kind of dessert! Gina, how do you think this would taste with whole wheat pastry flour? I have gotten away from using regular all purpose flour. Thanks! Also, your recipes are just amazing. frugil, yes, scrape out the pulp from the bean. I think whole wheat would be fine! brittle, not sure what rich's whip is but so happy you liked it! I used Rich's Whip instead of milk, sugar not agave, and all vanilla extract. Especially needed after 2 hours of screaming teething 6mo old twins. I stocked up on a bunch of canned pumpkin at the start of the season and I have been having so much trying out new pumpkin foods. 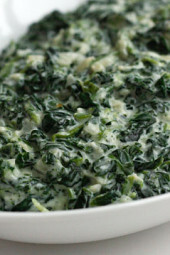 I one can left and I am saving it to make this recipe! I was wondering if I can use whole wheat flour instead? Thoughts? LOL, I thought I had a typo!! I'm so blonde, I just read a recipe for sweet poatoes, I meant pumpkin! I'm the only one in the house who will eat pumpkin, sounds crazy I know!! This looks so delicious! Since I'm the only one who will eat Sweet Potatoes in the house, I get this whole dish for me!!! Yum!! Wow, this is such a great idea. Way way way lower in fat than pumpkin pie. Great work (again) Gina! 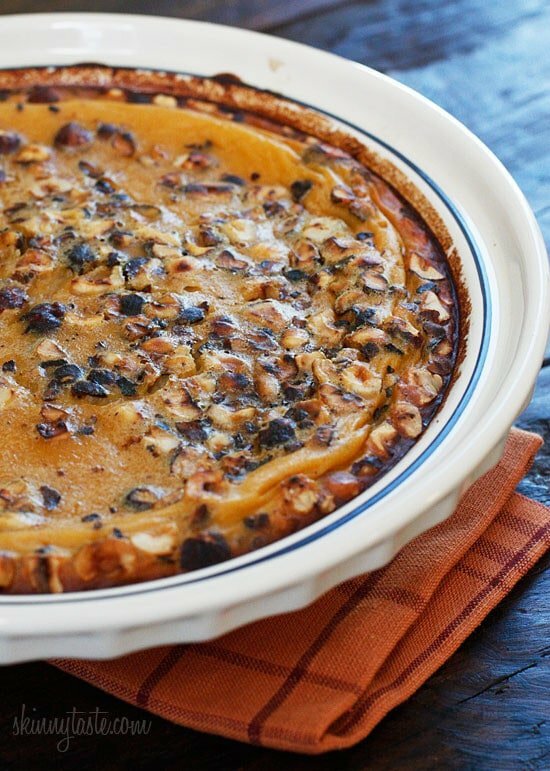 This is a great alternative to pumpkin pie. Love this idea! I have only tried berry clafoutis before, so this sounds really neat. 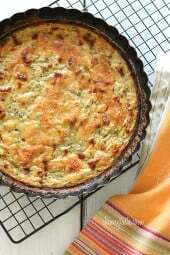 You can make the batter ahead of time and keep in a sealed container in the refrigerator. I wouldn't use less whole eggs, this is what creates the custard ans I think using less would hurt the texture, especially since there is no butter or oil here. Can you use egg beaters instead of the eggs and egg whites? Is there anyway this can be made in advance? Maybe just the batter, then bake later in the day? Or bake right away and reheat? Mrs Bess, it would still be tasty I'm sure! LS- Yeah, this is far easier! Thanks for the 1/2 cup plus 2 tbsp info, I guess that would be easier to understand, lol. This looks amazing, Gina! I want to host a pre-Thanksgiving dinner with my friends before we traverse the country to see our families, but I can't face making a pie crust, lol. This looks like the next best thing! That looks delicious1! Lokks really great! How would this be without nuts? I love them but the husband…not so much. I would reheat it, it's yummy warm. midnite, yes that is 10 tbsp agave, any less and I don't think it would be sweet enough, yet this isn't overly sweet. I can't wait to try this! Looks amazing! Is it better reheated or cold the next morning? Goddess Amanda, I'm sure coconut milk would be great! Even almond milk for those who are lactose intolerant. Jenny, sorry I am featuring Thanksgiving this week and last so they are all meant to feed a group. You can certainly halve this and make them in small ramekins for portion control! Spazz, are you baking this in a sugar pumpkin? 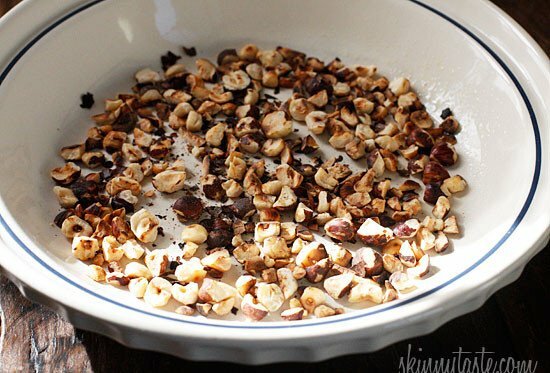 This is in the oven right now with walnuts instead of hazelnuts. I carved out a pumpkin just for this dessert. Smells so yummy. Any chance you could do some more recipes with smaller servings? There's only me & trying to scale down from 10 can be a little awkward. Planning my entire Thanksgiving menu around your Thanksgiving Recipes!! Most of the recipes are untested but I have made a bunch of your other recipes and they are all amazing so I am not worried one bit!! This will be a perfect ending to dinner. Thanks again!!! Could you use vanilla Cocnut milk to replace the vanilla and the milk in this?